High deductible health plans paired with tax-free savings accounts — increasingly common in job-based insurance and long a staple for those who buy their own coverage – pose financial difficulties for people with chronic health problems. That’s because they have to pay the annual deductible, which could be $1,250 or more, before most of their medications and other treatments are covered. In a white paper released Thursday, researchers at the University of Michigan say such plans would be more attractive if the IRS broadened the kinds of preventive care insurers were allowed to cover before the patient paid the deductible. Currently, only a limited set of preventive care benefits is included. “I want the deductibles removed on those things I beg my patients to do,” such as getting annual eye exams if they are diabetic, says author A. Mark Fendrick, a professor of medicine and director of the University of Michigan Center for Value-Based Insurance Design. If insurers were allowed to offer high-deductible plans that covered “secondary prevention,” such as eye exams, or insulin for diabetics, they would attract 5 million buyers on the individual market, the report projects. Many consumers would see the policies as an improvement over more “bare-bones” coverage, even if the premiums were higher, said co-author Steve Parente, a professor of finance at the Carlson School of Management at the University of Minnesota. At least 10 million in job-based insurance might also switch, some of them from more expensive plans that have limited networks of doctors and hospitals, Parente said. Such plans would be most attractive to those with chronic conditions such as diabetes, asthma or high blood pressure. “If it is attractive to the chronically ill, it could be a major change,” said Parente. The report was funded by the Gary and Mary West Health Policy Center, a nonpartisan research group in Washington, D.C. Still, such plans would carry premiums at least 5 percent higher than current high-deductible health saving account plans, according to the report. 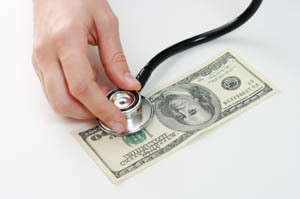 Whether the IRS would consider changing the rules for high deductible plans connected with health savings accounts is unclear. The agency did not respond to questions. If it altered the rules, insurers would also have to choose to offer the plans. Currently, more than 15 million Americans have high-deductible plans that can be paired with tax-free savings accounts, called HSA-eligible plans, according to America’s Health Insurance Plans, the industry trade group. Of those, about 2 million buy their own policies and the rest get them through their jobs. Under federal rules, such plans must have at least a $1,250 annual deductible for singles and a $2,500 deductible for families. Workers can contribute money pre-tax to the special savings accounts to help pay those deductibles. Most large employers offer such a plan as an option and an estimated 15 percent of firms offer only HSA plans or a similar arrangement, called a health reimbursement account, according to the benefit firm Towers Watson. Fendrick and colleagues want the definition changed to allow insurers and employers more options, including allowing coverage of any kind of medical services, including drugs, that would prevent complications from or a worsening of a chronic condition, such as diabetes, heart disease or major depression.